Wedding ring set, yellow and red gold with 1.4 ct. emerald. This is the most simple ring made at Macchiarini Creative Design. The quality of hand hammering work in it overshadows its simplicity and points up the "feel" and emotional superiority of hand-made work compared with machine-made, mass-produced jewelry. White gold with 1.5 ct. diamond. This ring floats the diamond up on a "spiral", which splits off to become the actual shank of the ring. 1 ct. "Pear" diamond, white gold wedding ring set. Sterling silver and yellow gold melted over band. 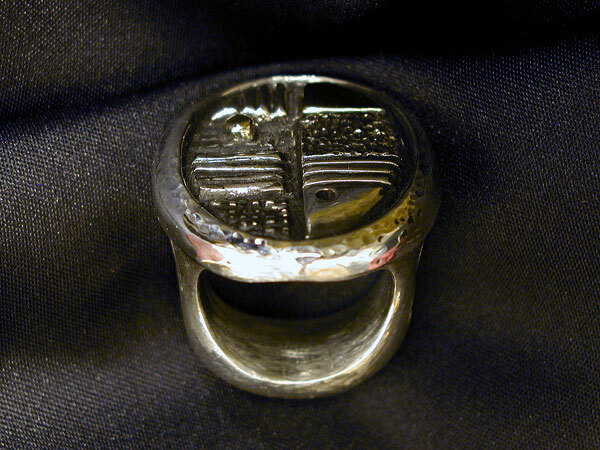 Sterling silver laborite ring with "red" bronze bezel. Gold, sterling silver, and red enamel inlay with Star sapphire cabochon stone. 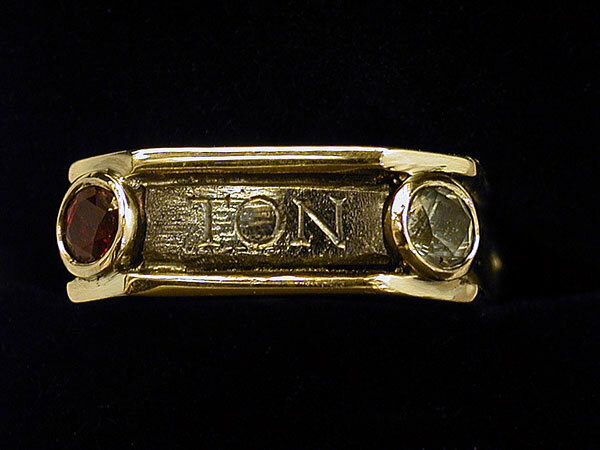 Yellow gold, meteroric iron, bronze square "Ring of God" with corner stones of Ruby (fire), Aquamarine (water), Emerald (earth), Diamond (air). Gold sphere on sterling silver with turquoise cabochon. Sterling silver with gold face and ivory eyes. Sterling silver with ivory inlaid eyes. 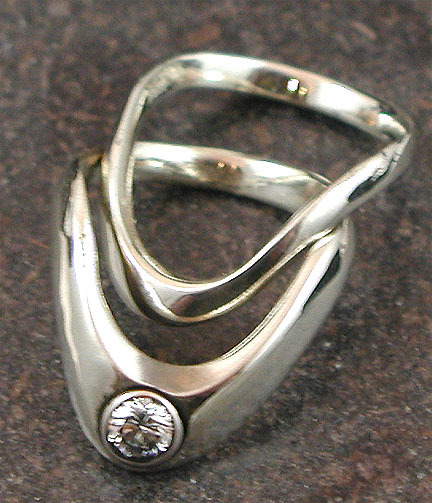 Variations on the original 1963 frog ring design by Peter Macchiarini. 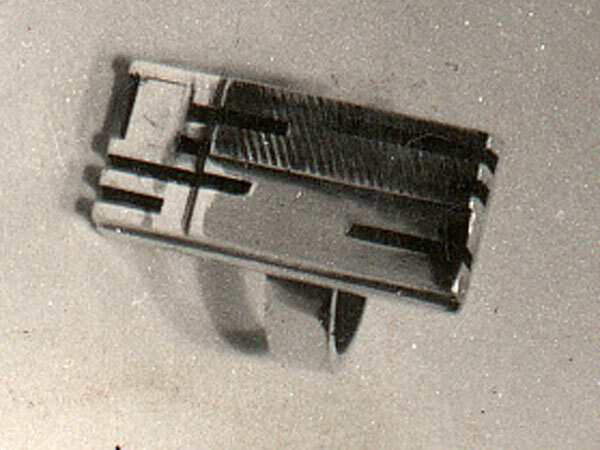 He made several editions of this ring. Sterling silver inlaid with ebony, ivory, and lapis, with sterling silver, silver, copper, and bronze dots. 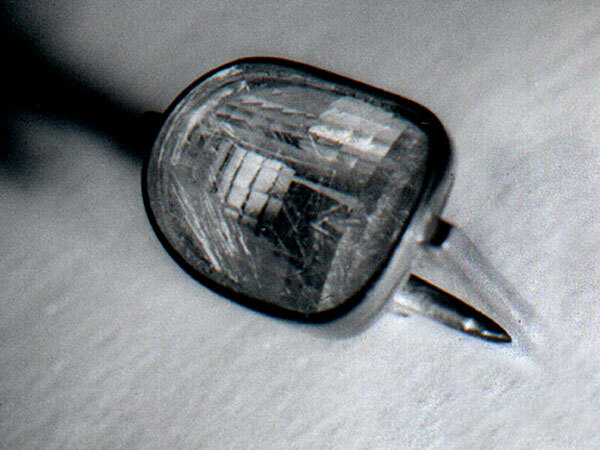 Sterling silver with cross-cut rutilated "saddle" shaped quartz. 12k gold and silver, rutilated quartz. 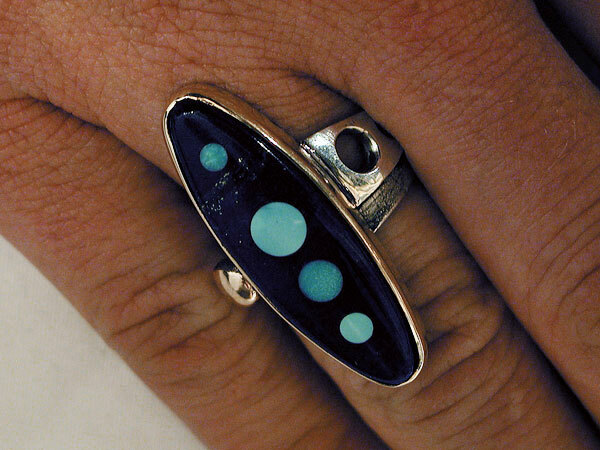 Oval lapiz with integrated turquoise dot, sterling silver and gold. Sterling silver with bronze bezel, inlaid ebony and ivory. Sterling silver, ebony and ivory. Yellow gold and sterling silver with rutilated quartz spiral cut stone and cabochon ruby.